That’s what we hear on a weekly basis. These customers were smart enough to protect and monitor assets with GPS tracking devices. Asset tracking units are a game changer in protecting valuables. Just ask our customer today that recovered his trailer in a couple hours. Trailer tracking units have a 5-year battery life. This system can conserve battery life by updating and then going into a sleep mode. This allows the battery to use little or no power while it’s powered down. This technology is idea for GPS trackers for long deployments. Many of our clients are construction companies and other businesses with assets they want to protect. When assets are stolen many times insurance claims can’t be filed. It risks insurance rates skyrocketing. So they take the loss of the equipment. For a minimal investment, equipment GPS trackers can monitor and protect assets. 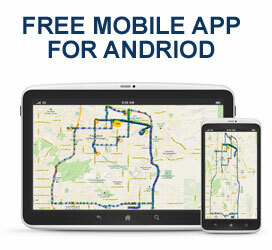 GPS tracking technology is affordable and exact locations. There are stolen trailer databases like stolen911.com that offer terrific recovery services. They have a detailed database that is monitored by police. This includes sales and tow yards. Services such as these are a great way to get the word out about trailer theft. These services utilize social media to get the word out about stolen assets. GPS and track offers GPS tracking solutions for most assets. From motorcycle GPS tracking to equipment tracking. There are tracking devices that go directly to power sources and GPS units that have long battery life. Even smaller equipment and motorcycle tracking devices are available. 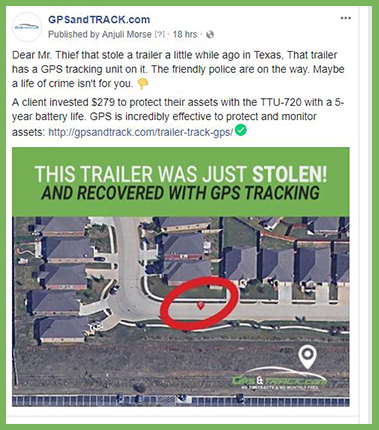 Read more GPS and Track stolen trailer recovery stories.